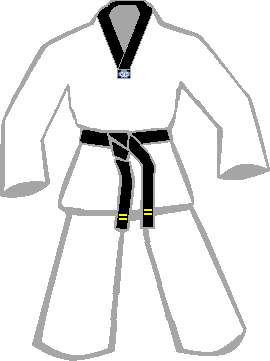 The dobok of the World Taekwondo (WT), or World Taekwondo Federation (WTF) as they used to be known, is distinguished from the ITF style primarily by the collar, which is a simple V-shape. 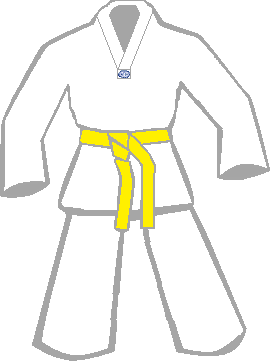 Grades are indicated by the colour of the collar; kup grades wear an all-white dobok, while dan grades have a black collar. 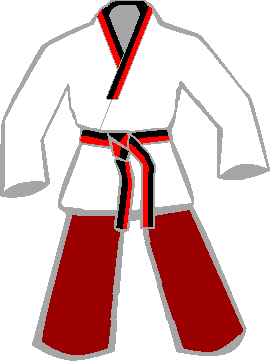 Poom or junior dan grades sometimes wear a dobok with a red and black collar. There may also be one or more stripes down the arms and legs, although these are not indicative of rank. 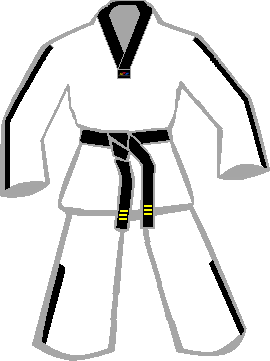 The dobok has Taekwondo written in English script and Korean characters on the back, and may have the WTF Logo (older logo / newer logo) on the front. For training and tournament sparring (Kyorugi), the standard uniforms suffice. For international patterms (Poomsae) competitions, a differently-styled set of poomsae doboks has been decreed. These keep the same general stylings, but have reverted back to the more traditional open & crossover style, with the collar detailing running partway down the edge of the jacket. They also come in a range of fetching colours, depending on grade, and (for some reason) gender.